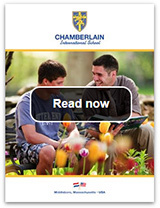 Welcome to Chamberlain International School, a co-educational therapeutic boarding and day school, serving students ages 11-22 from Massachusetts, across the United States, and throughout the world. Since 1976 the beliefs of our Founders who are still here on a daily basis continue on. It is what guides us each and every day with each and every individual student and that mission is to provide comprehensive and intensive therapeutic programming in an environment which inspires academic success and personal growth. We motivate and support our students throughout their school experience and teach them to recognize, nurture and celebrate their individual strengths as they prepare for life. We see the brightness and uniqueness in all of our students and we focus our energy on developing those positive qualities and abilities. Students who attend Chamberlain can feel a sense of home on a peaceful and picturesque campus of historic buildings surrounding a traditional New England village green. Chamberlain turned our son's life around. When he arrived at Chamberlain he had lost all hope of finding success in life. He was depressed, did not want to go to school and never thought he would get his diploma never mind get into college. Read, download, or share our viewbook.